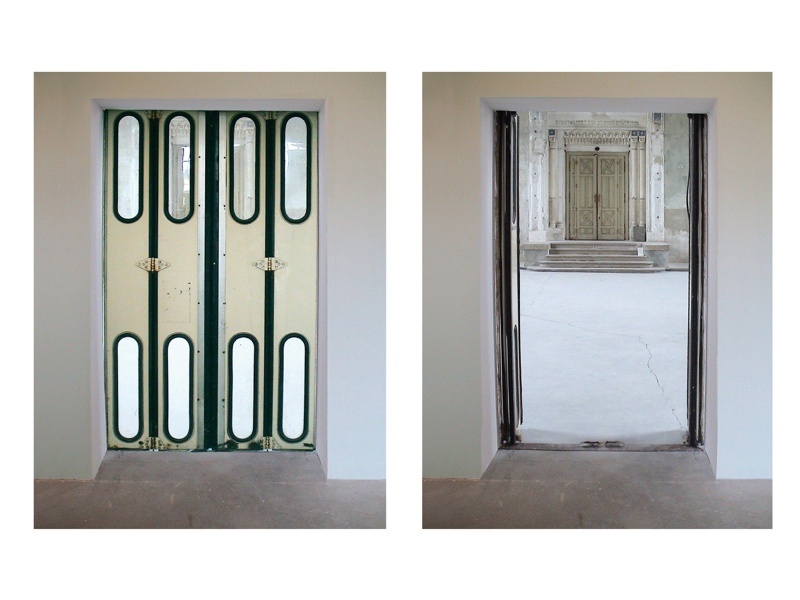 The space of a gallery itself (previously synagogue) with its specific spiritual geniusloci and an object – ready made – a city bus door with a time switcher, situated as the only entrance to the gallery creates the structure of the exhibition intent. The bus door as a personification of an everyday routine, an object we meet everydayand we associate it with a way how to get to various objectives, mostly into and out of work. Larger amount of people tending together with us reaching for her/his goal is associated with a bus door as well. Paradoxically, we find ourselves alone behindthe door in a spiritual space and we can (we are forced to) meditate about existencialquestions (also under the influence of a spiritual dimension of the space). We have no possibility to get out without a violence until the door reopens again. This “time to close” is set up through the program of a time switch which regulatesopening and closing the door this way (single intervals change, their length variesbetween 3 to 5 minutes), indirectly influences the restriction of a visitor’s movement. Visitor is notified by a sound and light sign before the door close (exactly the same as in the mean of public transport – by ringing and lighting the lamp above the door),that the door closes again.The concept works mostly with inducing of a certain atmosphere, when the visitor is forced to answer himself/herself certain questions – who and why opens and closesthe door (explainings: jamming manipulation – a game , where the visitor does notknow its rules, “the power of destiny”, intervention of God’s hand), how long timehe/she will be closed in the room. Shifting forward, which we feel physically behindthe bus door, can be identified with shifting in thinking of the visitor after enteringthe space of synagogue through the bus door, as a direct reflection in the synagogueas well as everyday memory getting on to the door on the way to reach the goal.